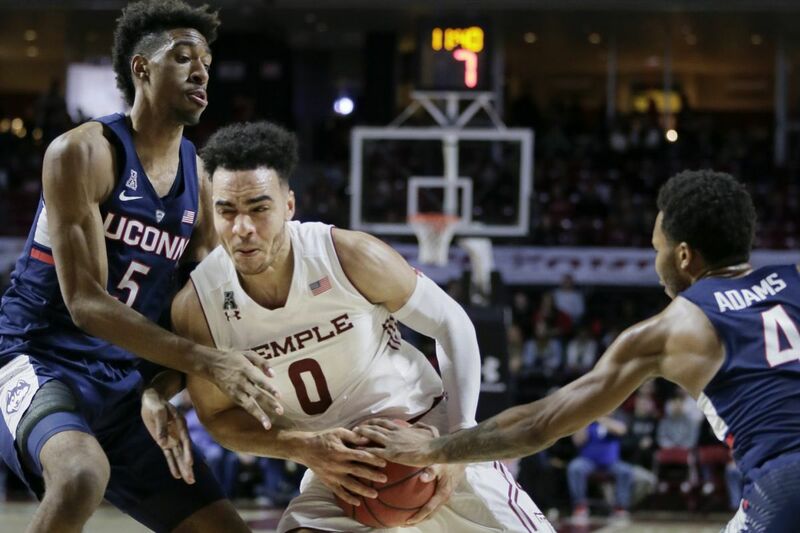 Temple’s Obi Enechionyia (0) received a $2,000 scholarship in being recognized as the American Athletic Conference basketball scholar-athlete of the year. Temple senior forward Obi Enechionyia has been named the American Athletic Conference men's basketball scholar-athlete of the year. The AAC announced the winner Wednesday. Enechionyia will receive a $2,000 scholarship, which may be applied to graduate or professional studies. The 6-foot-10 Enechionyia has been a member of Temple's Athletic Director's Honor Roll (3.0 grade point average or higher) and Dean's List. He will graduate in May with a degree in communications. The selection was made by the AAC's Faculty Athletic Representatives. "It's an honor to get that award," Enechionyia said. "Academics have always been something that myself and my family have seen as very important, and I know my family is pretty proud of that." In 127 career games, Enechionyia has totaled 1,271 points and 606 rebounds. This season, he is averaging 10.9 points, 6.1 rebounds and 1.4 blocked shots. Temple (16-14, 8-10 AAC) will face Tulane (14-16, 5-13) in an opening-round game of the AAC tournament at 7 p.m. Thursday at the Amway Center in Orlando.